The World Bank’s November 2017 report, A fair adjustment, on the efficiency and equity of public spending in Brazil, which endorses austerity in Brazil until 2030, raises serious questions about the methodology used and relevance of the report’s focus on fiscal consolidation. It contradicts its own admission that the deterioration of Brazil’s fiscal situation is due principally to the recession and not growth in spending. In November 2017 the World Bank released the report A fair adjustment: an analysis of the efficiency and equity of public spending in Brazil, which provides a synthesis of many studies on fiscal sustainability, civil service payment burden, public purchases, social security, labour market and social assistance programmes, health, education, and incentives to the private sector. Commenting on the report in a February Brookings Institution blog, Antonio Nucifora and Martin Raiser, Lead Country Economist and Director for the World Bank in Brazil, respectively, noted that the report finds that “much of Brazil’s public spending benefits the relatively well-off more than the poor, so there is room for serious fiscal adjustment without harming those most in need of government programs.” This raises the obvious question of how the World Bank concluded that the rich benefited more than the poor from public spending. Given that the report also admits that the deterioration of Brazil’s fiscal situation is due principally to the recession and not growth in spending, its recommendations cast doubt on whether the Bank considered alternatives to fiscal adjustment, which, in Brazil, has consisted of austerity measures focused on a dramatic reduction of public spending. The report endorses austerity in Brazil until 2030, praising the cap on public spending growth, a dramatic change in the federal constitution adopted just after President Rousseff’s impeachment in 2016 (see Observer Spring 2018). Public spending growth has been limited to that of inflation; amazingly, the cap’s rule does not even consider the trajectory of GDP and population growth. Notwithstanding this obvious flaw, which would result in a decrease in spending per capita or as a percentage of GDP, it also advocated a change in the composition of spending, based on the assumption that social security spending is the main problem in Brazil, calling it the “unpayable bill”. The report takes as its point of departure the highly dubious assumption that fiscal sustainability can only be achieved through austerity, thus ignoring more effective and equitable policies. This in turn not only results in policies that disadvantage the poor and erode gains made in the human rights of the marginalised; it threatens the legitimacy of the Bank’s self-professed intellectual and normative leadership. Disappointingly, the report suffers from serious methodological flaws and inconsistencies. These reveal the shortcomings in the analysis that underpins its approach to fiscal responsibility. First, there are simplifications in the statistics presented to examine who currently benefits from government programmes. The report used averages and quintiles to label regressivity or progressivity in spending, but did not take the necessary care in assessing the evolution and existing dispersion in the figures on inequality in Brazil. This is exemplified by the gross error in the calculation of the average cost per student of federal universities, which the report calculates by using total university expenditure figures. These however include numerous items not directly associated with the teaching costs of undergraduate students. Second, in some paragraphs, apples and oranges were compared, as different data sources, types of variables and time periods were put together and used to make comparisons. These imprecise comparisons disregard trends and create a distorted picture of the reality in Brazil, which in turn leads the Bank to support counter-productive and inequitable policies. Importantly, as mentioned above, the report concluded that the deterioration of the fiscal situation was caused by the recession and reduction of revenues, and not the spending growth. Third, in many instances the methods of calculation in the report are not transparent, as assumptions, data sources, and robustness tests are not clear or even provided. For example, in the first paragraph of the first chapter, no mention is made of whether real or nominal data are used, and no explanation about GDP growth compared to public spending is provided. Finally, many of the report’s findings about the efficiency of public spending disregard its outcomes, not estimating the resulting benefits, such as positive impacts on average income of the population and of target groups, employment creation, the multiplier effect in demand generation within the economy and the improvements in quality of life implied by these factors. The concept of opportunity cost – the benefit that could have been gained from an alternative use of the same resource – is too important in mainstream economics to be neglected in the methodology. Besides the above-mentioned inaccuracies and methodological shortcomings, the report’s very definition of fiscal sustainability is biased. Although public budgets consist of spending and revenues, the report focuses on spending only, making few considerations about the country’s regressive tax system throughout its analysis. The report’s authors recognise this gap, but justify it by stressing that “tax reform would demand a lot of preparation”, as if the spending reform does not and as if its proposals were the only alternative available. This approach is highly problematic as it limits the report’s consideration of policies that could be both more effective and more equitable. As evidenced, for example, by the 2002 IMF working paper titled ‘The Effectiveness of Fiscal Policy in Stimulating Economic Activity: A Review of the Literature‘, there is a long-standing theoretical controversy, both worldwide and in Brazil, on the effects of public spending on wider economic dynamics. In a nutshell, on the one hand, the austerity narrative holds that recurrent deficits lead to demand-led inflation and increases in public indebtedness, pushing up the interest rate and increasing the investment costs – a supply side approach that is premised on the existence of a natural rate of unemployment of labour and capital in the economy, i.e., no involuntary unemployment. According to this view, in the long-run deficit spending would result in a decrease in economic activity. On the other hand, demand-side narratives argue that in cases of persistent unemployment and economic downturns, such as in Brazil, the rise in public spending or fall in taxes can stimulate the economy, encouraging investment growth due to the prospect of higher demand. The recent fiscal adjustment in Brazil has been coherent with the first theoretical and ideological view, which prevails in IMF and World Bank analyses and is also shared by the financial markets. The report seems to indicate that no consideration was given to the demand-side options, such as those proposed in the October 2016 Brazilian Society of Political Economy report, Austerity and Regression. 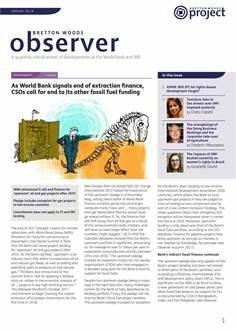 We would expect from the self-styled premier international development bank a more precise empirical assessment of public fiscal policies and economic performance in Brazil, especially regarding fairness, a weakness identified by the Independent Evaluation Group’s March report on the Bank’s pursuit of its shared prosperity work (see Observer Spring 2018). The World Bank report on Brazil intentionally presented a situation in which austerity was assumed as the only viable path to fiscal sustainability, skipping the crucial debate about taxes and public revenues. This poses significant dangers, as its recommendations affect the lives of already poor and marginalised populations. It also threatens the Bank’s international credibility. It is no coincidence that many of the authors and contributors of the report are members of the current government. Indeed, the report’s assessment and policy recommendations build a narrative that is pretty much aligned with the direction of actual public policies and ongoing reforms suggested by the current government of Michel Temer, whose legitimacy is, to say the least, questionable. First, as noted in an October 2017 article by School of Oriental and African Studies professor Alfredo Saad-Filho, many consider that a judicial-parliamentary coup d’état took place in Brazil in 2016, where the former president, Dilma Rousseff, was removed for the alleged crime of “creative accounting” or “pedalling” in fiscal policy. Second, the current president has himself been implicated in corruption scandals. Third, the policies and reforms proposed by his government are contradictory to the wishes of the Brazilian people, as reflected in March opinion polls reported in the Brazilian newspaper Folha de Sao Paulo, which found that 71 per cent of those polled were against the changes to the social services provision system. It is also worth noting that, according to a November 2017 article in Brazilian newspaper Brasil Economico, the report was requested before the impeachment of Rousseff by former finance minister Joaquim Levy in 2015, who strongly supported and pushed fiscal adjustment, and is now a World Bank Managing Director and Chief Financial Officer. As Figure 1 illustrates, data from the World Bank online database reveal that Brazil experienced a drop in general government expenditure measured in the national currency, in constant terms, in 2015 and 2016. Actually, the annual growth in constant local currency of general expenditure of the central government has fallen every year since 2011, recording negative rates in 2015 and 2016. However, expenditure measured as a percentage of GDP has increased since 2013, reaching 20.2 per cent in 2016, because GDP has fallen even more. In the chapter about social security, the Bank argues that the Brazilian social security system is too generous when compared to international standards, and that the population is getting older so that pensions for retired workers will grow as a share of the public budget, squeezing resources for other priorities. Again, the findings lack rigour and transparency in the estimates. They also contain other conceptual mistakes, such as not making the careful distinction between costs associated with general social security costs and those that apply to the public sector, in which the high payments for law judges and attorneys are clearly outliers that distort the average. Explicitly, the report recommends the social security reform presented by the government as a requirement, despite admitting on page 80 that it is far from a final solution. The chapter on education also illustrates the inequity of the report’s recommendations. It argues that almost 50 per cent of the federal spending on higher education should be cut because it is inefficient. The Bank suggests that Brazil’s system of free public universities should be replaced by a system with tuition fees and an increase in public funding for private higher education. Besides stressing that the university students are mainly from wealthy families who could afford to pay and currently benefit from government largesse, the report argues for a reversal of priorities in educational spending, with a focus on basic education. Further, the report stresses the high per-student cost at public universities, and the minor “added value of knowledge” of students in public rather than private higher education. As noted in a December 2017 article on Plataforma Política Social, which analysed the implication of the Bank’s report on education, these arguments are controversial and the numbers presented have been heavily critiqued. Furthermore, the World Bank is missing the important fact that the share of the poorer students at public universities in Brazil has increased since the expansion of the public network and the adoption of institutional places for students from public secondary schools, which substantially benefits black students. The Bank ignores that the advance of the rights of the marginalised that benefit from the current system have been achieved after decades of social struggles for the empowerment of the poor through, among other things, their integration into the educational system. The World Bank presents a top-down analysis of costs without sociological research about the needs and desires of the population. The complex role of the state, particularly in very unequal societies such as Brazil, is ignored and the Bank’s recommendations undermine rights and historical social achievements reached through government programmes during the administration of presidents Lula and Rousseff. For example, the report defended the merging of the rural security system with the Bolsa Familia assistance programme, which diminishes the importance of the former. It criticised programmes that protect labour rights, supported the unpopular labour reform of 2017 and argued for reductions in health spending. It also did not hesitate to recommend that students pay for public higher education and supported an increase in public finance for private education. As if this were not enough, it criticised government programmes that, although not perfect, have had some positive redistributive effects. This includes, for example, helping to reduce hunger in Brazil, as shown in the Food and Agriculture Organization of the United Nations’ The State of Food Insecurity in the World 2014 report. Last but not least, most of the changes in public policies recommended by the report offer profitable opportunities for a small number of powerful and rich national and international companies that compete in oligopolistic markets under weak regulatory frameworks. At the same time, it leaves workers and the poor unprotected, seriously jeopardising the redistributive ability of fiscal policy. Thus, the report is far from promoting an equitable model. It is rather an undemocratic ideological commitment to the interests of Brazilian elites and of international capital represented in the current government. Given that we are supposedly in a post-neoliberal era and in light of the Bank’s rhetorical focus on ‘equitable growth’, perhaps we were naïve in expecting better from the report. Cristina Fróes de Borja Reis is Fellow of an international post-doc initiative at the Technische Universität, Berlin. She was appointed Professor of economics and international relations at the Federal University of ABC, Brazil in 2013. Her research interests include global value chains, innovation, and the Brazilian economy. Daniela Magalhães Prates is Associate Professor of economics at the University of Campinas and researcher at the Brazilian National Council for Scientific and Technological Development. Her main research areas are international and monetary economics.